For some reason, those of us who inhabit the more industrially developed nations of the world seem to believe that doing more will somehow yield us more. When we mistakenly enter into this thought pattern, we come dangerously close to mistaking activity for accomplishment. Despite what most of us have been unconsciously conditioned to believe, the two are not necessarily connected. As I drove to the office this morning, a young woman reminded me of our propensity to cram every waking moment of our existence with projects and tasks in hopes that we might gain more control over our lives. The young woman was driving a car in the lane next to me. As we headed down the expressway, I couldn't help notice her: It was the first time I have ever seen anyone eat breakfast, talk on the phone, apply eye makeup, and sort through papers while driving a car at sixty-five miles per hour. This woman wasn't alone in her pursuit of multitasking nirvana, either. The fellow driving just behind her was reading a newspaper, drinking coffee, and yelling at three arguing kids seated in the backseat. This perpetual multitasking is not a problem we succumb to only while driving. Just this morning, as I sat in Central Park enjoying the shade of a 200-year-old oak tree, I happened to catch sight of a jogger talking on his cell phone and fiddling with his Palm Pilot while he ran. Similar observations by friends in Europe and Asia suggest this is not just an American ill; it seems to be part of a worldwide phenomenon. We're all too busy for our own good. Most of us live as if we will be judged at our final reckoning according to the number of crossed-off items on our cosmic to-do list. I'm not sure what it is that causes otherwise rational people to think that, by working harder, faster, and longer, they'll get everything done, when they know by experience the exact opposite is true. Often the harder, faster, or longer we work at a task the less effective we become, and in most cases getting "everything done" is a human impossibility. We're just not built to move at the pace most of us tend to push ourselves to. The technology we once thought would make our lives simpler is actually producing the obverse effect. Cell phones, PDAs (Personal Digital Assistants) with satellite capabilities, voice mail, E-mail, and the like, bring the world within our reach. Unfortunately, they also bring us within the reach of the world. Our tender senses are assaulted every moment by billions of new and changing sights, sounds, smells, and other sensations. More information is hurled at our minds today than at any time in history, and we are reacting negatively to the overload. The human attention span is shrinking in response to the ever-increasing number of demands being placed on it, and our nerves are raw from wear. Too Busy for Peace, Joy, Spiritual Connection? To maintain our sanity and preserve a small scrap of solitude, we learn to block most of the sensations that we deem nonessential. In consequence, all that is sensuous and spiritual ricochets off the impenetrable wall we have erected. 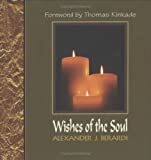 Such is another of life's follies: In a vain attempt to quiet our tired minds and draw closer to the sound of our souls, we strain out the very things that will bring us peace, joy, and the spiritual connection we seek. The absurdity is this: The more we fail in attaining peace through filtration, the harder we try. Until one day we have blocked so much from our lives, we find that we're not really living at all; we're merely alive. In order to draw closer to our soul, we need less in our lives, not more. Instead of hurrying to fill the voids in our schedule with more activity, we need to take time to experience the sensual and spiritual side of life: We need to nourish the relationship with our soul and allow it to grow. Sensuality is akin to the soul. We need to bring sensuality back into our everyday lives. When was the last time you lay in fresh-cut grass and felt the warmth of the sunshine on your face and the softness of the breeze on your skin? Can you remember the last time you spent the entire day in bed with your lover, or ate spaghetti with your hands? We seem to be able to make time for everything else, but we need to make time for the sensual things in life, the things that really make life worth living. We need to make time for doing nothing at all, so we can once again experience the joy of serenity. We need to slow down a bit, so we can become in synch with nature. We need to feed our souls with sensuality, quiet, and reflection so we can better communicate with God. Because God dwells deep within us, we need to allow ourselves the time to experience one another on a much deeper level, to see the similarities rather than the differences, and to get past the small talk and share with each other the deep human experiences we all have every day. To help us get to know each other better, we need to share things like the gift of humor with each other. We also need to take time to share an honest compliment or a simple hug with everyone we meet. I believe these are the mechanisms by which God's comfort can pass through our soul to the soul of another. We need to tear down the walls that we have built between our souls and the souls of others. Only then will we begin to see a glimmer of evidence of the God that lives within all of us. Never Offer Your Comb to a Bald Man: How to get what you want by giving others what they need! This worldwide bestseller has changed the way leaders think about leadership. Alexander J. Berardi is a high-level healthcare industry entrepreneur, owner of seven successful companies, a professional speaker and trainer, and a leader of more than 700 employees. Each of his companies serves either an ailing element of society (elderly, sick, or poor) or those who serve them. He walks his talk, and the success of his companies lead major hospitals and healthcare organizations to solicit his advice. Now, he speaks to hospital presidents, nurses, administrators, doctors, and other healthcare workers on his topic, servant leadership. You are here: Home > Living > Finance & Careers > Career & Success > How Do I Know If I Am On My Life Path?